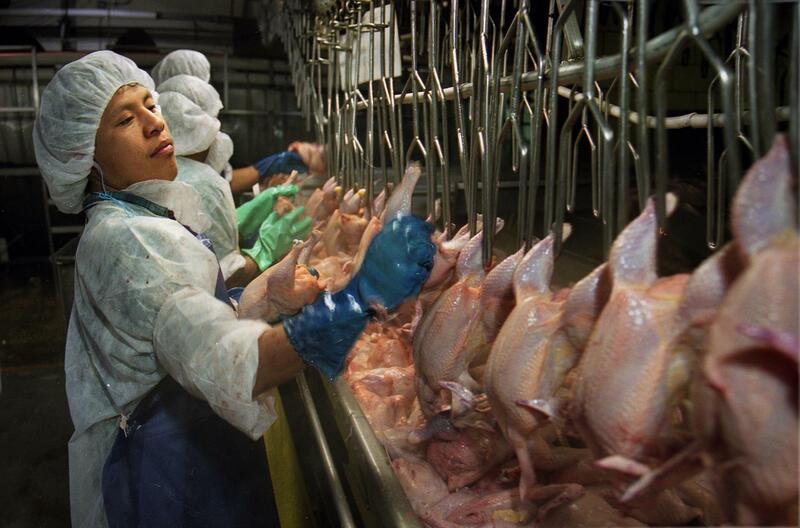 Poultry workers at major U.S. companies are highly susceptible to repetitive motion injuries, denied bathroom breaks and are most often immigrants and refugees. Pushed by worker advocates and growing consumer awareness, Tyson Foods on Wednesday promised better conditions for workers at its meat processing plants. Tyson, in a rare move in an industry heavily criticized for lack of worker safeguards, announced it would provide regularly scheduled bathroom breaks, give more attention to line speeds in the plants, offer training on workers’ rights and establish safety councils that include employees. The initiatives are an expansion of a workplace safety pilot program begun in 2015 and social compliance audits initiated in 2012, says Gary Mickelson, a Tyson spokesman. They are also part of new CEO Tom Hayes’ deeper focus on sustainability, Mickelson says. The announcement was made in conjunction with Oxfam America, an anti-poverty group that had long pushed for such concessions, and the United Food and Commercial Workers International Union, the primary union for 70,000 U.S. poultry workers. A Harvest Public Media investigation found that the more than 500,000 men and women who work in slaughterhouses and meat processing plants have some of the most dangerous factory jobs in America. Government fines for abuses are low and lines speeds are so fast workers are often crippled for life with repetitive motion problems, the report found. In a report issued last year called “No Relief,” Oxfam charged that workers at the four largest U.S. poultry companies -- Tyson Foods, Sanderson Farms, Perdue Farms and Pilgrim’s Pride -- are routinely denied bathroom breaks, forcing some to wear adult diapers to work and others to urinate on themselves to avoid retribution from supervisors. Oxfam and other worker advocates want to use consumers as a lever to push companies to make changes. Without pressure from grocery-shoppers – much like buyers’ growing concerns about animal welfare issues and antibiotic use – food companies were slow to respond, says Oliver Gottfried, a senior campaign strategist for Oxfam America. Gottfried pointed to an Oxfam petition signed by 150,000, demanding that Tyson Foods, Sanderson Farms, Perdue Farms and Pilgrim’s Pride offer fair and safe working conditions. Tyson, based in Springdale, Arkansas, employs 114,000 people, including roughly 95,000 in the company’s U.S. chicken, beef, pork and prepared foods facilities. Wednesday’s announcement was among the first for incoming COO Noel White, who was named to the spot in February following a shakeup in Tyson’s leadership team. Other initiatives announced Wednesday include wage increases, publically sharing results of a third party audit on worker conditions; upping benefits, including more vacation and holidays, and expanding existing safety programs. Gottfried says Tyson is the first company to respond to Oxfam’s call to action. Next up is Perdue, which Oxfam will visit this week to give them customers’ petitions calling for better working conditions. The meatpacking industry has had a culture of secrecy and a lack of transparency in the past, Gottfried says. The more consumers know about that, the more that culture will change, he says.